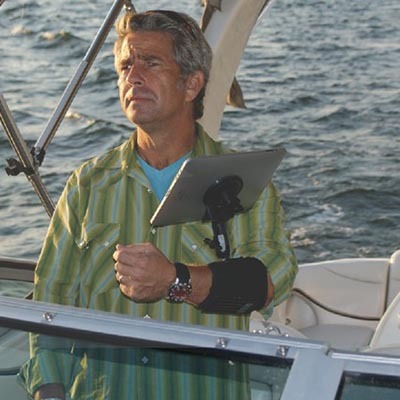 iPads and other mobile devices have inspired a huge market for accessory devices. From obvious things like cases and covers to specialized attachments for those in medical practice or other high-end industries. Then you have the, well, LESS useful accessories, or ones that are useful but just bonkers. That’s what this page is all about. Those plain old crazy iPad things that really should never have been more than a discarded idea card in a bin somewhere. Although, I’m not one to judge (too) much. So where possible I’ve included links to purchase these monstrosities. OK, so in a way this makes sense. I’m pretty sure most iPad owners spend a (not insignificant) amount of time with their iPads while going no 2. So if you want junior to get with the program early then the iPotty (really?) is probably the best way to do it. 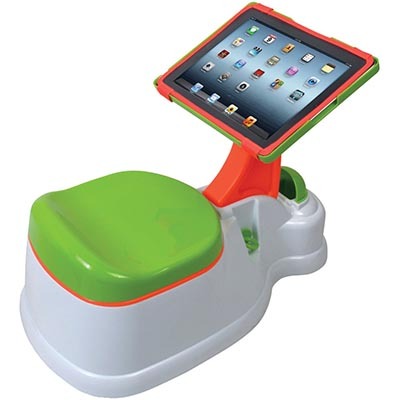 It’s a whole plastic potty trainer with an iPad holder built into it. It will take 2nd, 3rd, and 4th generation iPads. So if you still have an old iPad 2 lying around, then guess where it’s heading! You know what’s hilariously ironic? The item most frequently bought along with this is “The Potty Book: For Boys” by Alyssa Satin. Not an ebook. An actual paper book. The mind boggles, really. A good portable keyboard can be a fantastic companion to your iPad that lets you leave the notebook at home. In fact I have a page of reviews detailing some of the best ones(LINK). This keyboard, on the other hand, is not a good companion to your iPad. Basically it’s a piece of capacitive material in the shape of a keyboard that you (I kid you not) stick on and peel off your screen. 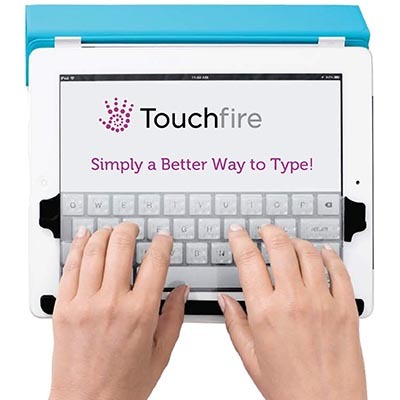 It is overlaid on the software keyboard and gives you a tactile feel so that you can type better. OK, so here is the problem I have with this keyboard. The whole advantage that a tactile, physical keyboard gives you is that you don’t have to look at the keyboard as you type. This in no way let’s you do that. You still have to look at the screen to type. How does this improve things? This is the very definition of a pointless product. It would make a great joke gift though. Buy it for someone you REALLY don’t like. 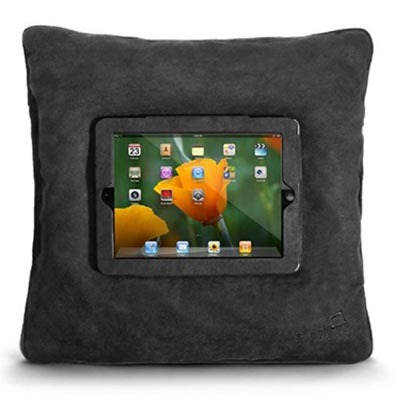 I just don’t get the point of an iPad pillow like this. 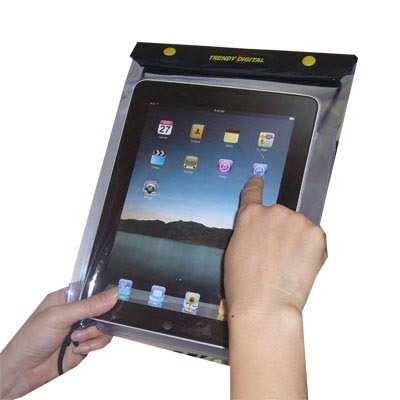 Some people say that it protects the iPad if kids drop it (face up, presumably) and that you can use it as a stand. I just don’t buy it, to be honest. It seems other people have come to the same conclusion and the product has been discontinued. So if you want to get this as a novelty, you’d better hurry. 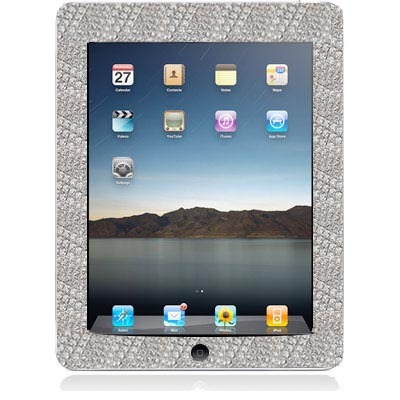 Diamonds are a girl’s best friend, but what about an iPad? Back in 2010 when the first iPad hit the market, we were treated to the garish horror that is the Mervis Diamond iPad. Priced at a pants-wetting $20,000 there is no information on whether coating an iPad in diamonds improves its performance on drop tests. Pulled straight from the twisted mind of the internet and its unhealthy obsession with bacon comes this textured (shudder) bacon meat case. I’m sure that Lady Gaga must be stockpiling these. Just be sure, as the company reminds us, to buy from them only as there are apparently knockoffs going around that lack the 3D texture. Great. Inspired Cases 3D Textured Bacon! I’m not ripping on waterproof iPad cases. There are some really great ones out there. If you need to ruggedize your iPad for some reason, then who am I to argue? But this. This … thing! It’s just a plastic bag; it isn’t even form fitting. The iPad just sort of sits there. Can’t I just re-purpose one of those plastic paper folder bag things and get the same effect? You can also wear it around your neck. Maybe you can combine that functionality with a picture of a giant clock on your iPad and go pull off an impromptu Flava Flav impersonation. 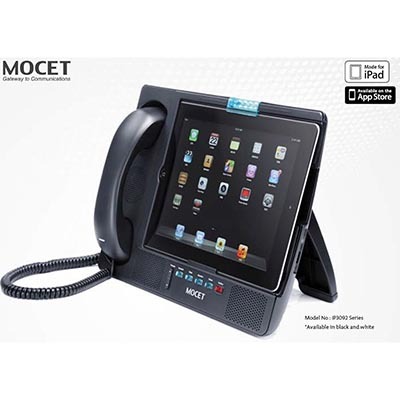 Turn your $1000 iPad into a $50 voice over IP phone. OK, this is not a real product obviously. It’s supposed to be so stupid that no one would believe it. The reason it’s on this list is because I could totally believe it exists – because I have no faith left in humanity. 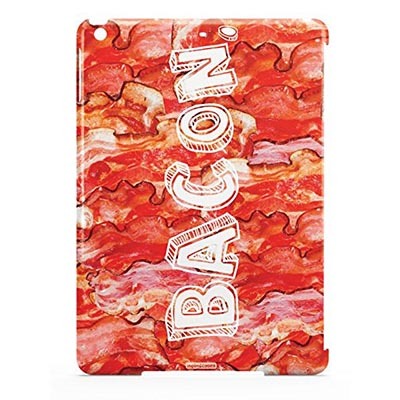 You saw the 3D bacon case right? Doesn’t this seem reasonable in comparison? Anyway these foam balls (ballz?) are meant to keep an iPad from breaking in a bad fall and to keep it off the dirty ground. 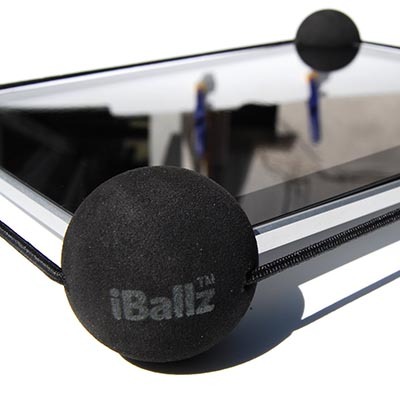 It’s mostly marketed as something to child-proof an iPad, but honestly, there’s no dignity in this. Hey, I’m not going to tell anyone how they should spend their money, but if you decide to buy any of these things without even a hint of irony, then maybe it’s time to re-examine your life choices. Honestly though, the only reason the Apple Watch doesn’t top this list is because it does not, in fact, work with an iPad.